One of the most remarkable climate events in the last two years has been an exceptional cooling in the eastern sub-polar North Atlantic (ESPNA, Figure 1), commonly referred to as “the cold blob”. Occurring while the planet experienced the warmest temperatures on record, this somewhat surprising cold anomaly has stirred considerable attention on the media (e.g. The Guardian, The Daily Mail, The Washington Post), as well as great interest among the scientific community. Figure 1: Mean 2015-2016 sea surface temperature anomaly with respect to the period 1900-2016. The first efforts focused on understanding its origin. Transient climate simulations show a “warming hole” anomaly in the same region of the cold-blob, associated with long-term decreases in the strength of the Atlantic Meridional Overturning circulation (AMOC) (Drijfhout et al., 2012; Rahmstorf et al., 2015). 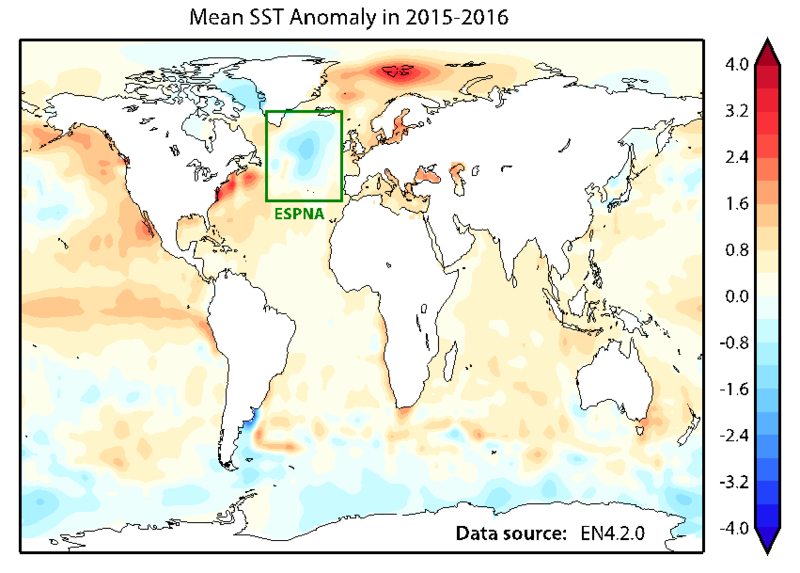 Additionally, analysis of long control simulations show that similar ESPNA coolings can emerge naturally, due to internal decadal fluctuations in the North Atlantic (Ortega et al., 2016; Robson et al., 2016). These cooling events are caused by weakenings of the northward ocean heat transport, following previous decreases in the AMOC strength. Likewise, analogous warming episodes tend to appear in response to AMOC strengthenings. A potential negative feedback between the AMOC and the NAO was identified in Ortega et al. (2016) and could explain these trend reversals. The analysis in Robson et al. (2016) also identifies deep Labrador Sea densities as a key proxy of the AMOC changes (for which only limited observations are available), thus extremely useful to investigate the chain of events that likely led to the observed cold blob. These are summarized in Figure 2. Figure 2: Evolution of the anomalous NAO, deep Labrador Sea densities (averaged between 1000-2500 m) and the top 700 m mean temperature in the ESPNA. Deep Labrador Sea densities are here used as an indicator of the changes in the AMOC strength. Anomalies refer to the period 1961-1990. 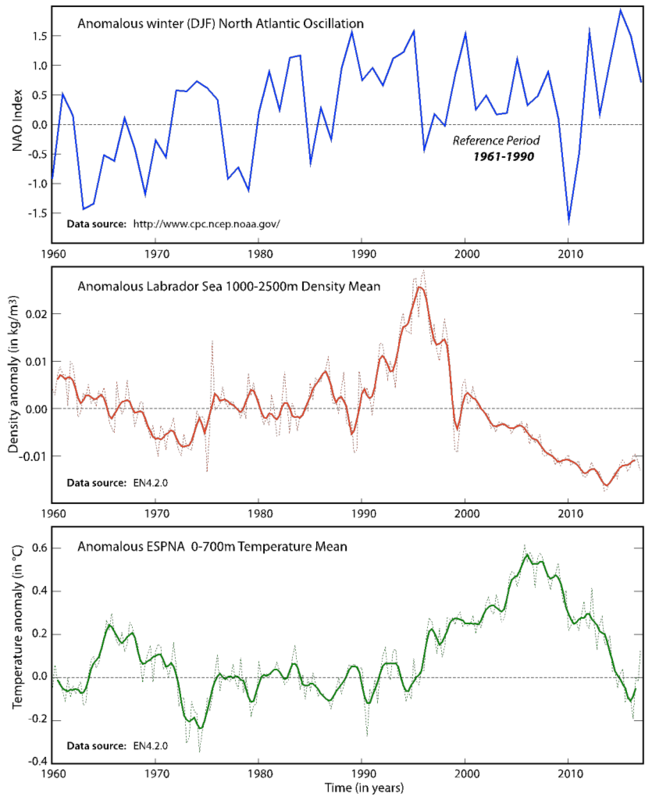 During the 1980s and early 1990s, the North Atlantic Oscillation (NAO) was predominantly positive. Associated with this, strong and persistent heat fluxes over the Labrador region enhanced deep-water formation and led to a maximum of the AMOC strength in 1995, inducing a subsequent warming of the ESPNA. From 1995 to 2010, the AMOC experienced a strong decrease, mostly explained by a concomitant tendency towards more negative NAO phases. This AMOC weakening reversed the warming trend over the ESPNA, and gave rise to the record-low temperature anomalies observed in 2015 and 2016. Thus, evidence suggests that the AMOC weakening responsible for the cold blob was internally driven, and not triggered by long-term changes in the anthropogenic forcings. We cannot rule out, however, a contribution of the radiative forcings (including anthropogenic and volcanic aerosols, and solar irradiance) to these decadal changes in the North Atlantic, e.g., through a modulation of the NAO phases. Figure 3 (Left) Top 700 m mean temperature anomaly (T700, in °C) in 2015-2016. (Right) T700 mean temperature anomaly in December 2016-January 2017. Anomalies refer to the period 1961-1990. For further reading on the cold blob and its causes, there is a special issue on US CLIVAR Variations. Drijfhout, S., G. J. van Oldenborgh, and A. Cimatoribus, 2012. Is a Decline of AMOC Causing the Warming Hole above the North Atlantic in Observed and Modeled Warming Patterns?, J Clim 25, 8373–8379. Ortega, P., J. I. Robson, R. T. Sutton, and A. Martins, 2016. Mechanisms of decadal variability in the Labrador Sea and the wider North Atlantic in a high-resolution climate model, Clim Dyn, Published Online. Rahmstorf, S., J. E. Box, G. Feulner, M. E. Mann, A. Robinson, S. Rutherford, and E. J. Schaffernicht, 2015. Exceptional twentieth-century slowdown in Atlantic Ocean overturning circulation, Nat Clim Chang 5, 475–480. Robson, J., P. Ortega, and R. Sutton, 2016. A reversal of climatic trends in the North Atlantic since 2005, Nat Geosci 9, 513–517. This entry was posted in Climate, Climate modelling, Numerical modelling, Oceans and tagged Atlantic Meridional Overturning circulation. Bookmark the permalink.